Thanksgiving welcomes everyone to the dinner table and while we all feast on the big day no two family feasts look exactly the same. Yes, there is the traditional fare; turkey, stuffing, mashed potatoes, pie; but there are a million different opinions and family recipes on how to make them. While we may differ on what to eat or when to eat at the end of the day the result is the same, a large cleanup job. 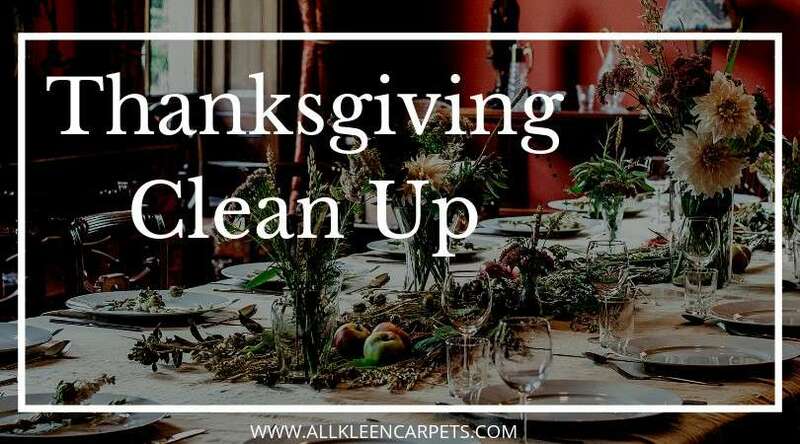 To make the big clean up a bit easier, and quicker, we have compiled some expert post-Thanksgiving clean-up tips. Prep as much as you can in the days leading up to the big day. This eliminates a ton of clean up on the big day and gets you back to activities you rather be doing. For example: you can make mashed potatoes ahead of time and freeze them until you need them. Make cleaning a fun group activity and get the whole family in on the process. If you are not into having guests clean just give a task to each member that lives in the home. To encourage kids to help give a reward or prize for a job well done or the family member that gets their job done the fastest with the best accuracy. Purchase some Ziploc or Gladware plastic containers and line them up on the counter all ready to go for guests to take home leftovers. Because Thanksgiving leftovers make the best party favors and it keeps the fridge free of overload. Crockpot liners and foil are big cleaning helpers. Crockpots are great for making a myriad of dishes and taking some of the stress off of cooking multiple dishes at once; just stick a crockpot liner in the pot before loading it up and remove after you empty the food. Voila! Crockpot is clean. In the same way you can line baking sheets bound for the oven with foil. When you are done with the sheet just remove the foil and put back in the cupboard instead of needing to scrub in the sink. If you are expecting a really large number of guests consider making a sign-up sheet sent in an email that includes side dishes as well as cleaning tasks. You don’t need say 15 extra side dishes at dinner, and some people are more comfortable helping out than cooking anyway. Set up a soaking station and soak those gunky pots and pans in warm soapy water as soon as you transfer food to serving dishes. Let them soak while you eat and enjoy your meal and they should make for easy, scrub-free clean up after. Double or triple line the garbage can. It is highly likely you will have more than one can full of garbage. Line the can with two or three bags so once you pull a full one the can is instantly ready to receive more garbage. Be ready for stains. Have a stain-fighting kit ready to treat spills and stains, especially on carpet and upholstered furniture. Make an appointment for a professional deep cleaning. There is no better time to get your annual deep cleanings of tile, grout, stone, hardwoods, carpet, and upholstery done than after a big party. Doing it now is also like two cleanings in one because your kitchen and other surfaces will be their cleanest clean after Thanksgiving and ready to take on new guests for Christmas. For holiday professional deep cleaning in Lynnwood and surrounding areas make an appointment online on over the phone with All Kleen.